Nuts with Cranberries and Dark Couverture Chocolate. YES! Cranberry and Dark Choc Snack Bars are a deliciously different way to snack. Sumptuous cranberry and dark chocolate are woven among crunchy almonds and peanuts to provide a taste experience you won't forget. These nut bars are also a source of protein and are high in fibre, and contain 5g of sugar per bar. A tasty and wholesome* snack. *Source of protein - protein contributes to the maintenance of muscle mass. YES! Snack Bars aim to deliver great nutrition but don't think that you should have to compromise on taste. Using wholesome, delicious ingredients YES! creates new, interesting flavours using deliciously different flavour combinations. If you enjoy YES! Cranberry and Dark Choc Snack Bars, why not try YES! 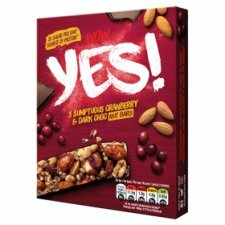 Beetroot and Apple Snack Bars? Juicy apple and mellow beetroot combine to make a tasty, distinctive snack. Say YES! and revolutionise your snack time!